The year 2013 was for us a year of intense work and maximal concentration on providing professional Kanban solution. We did our best to provide you with a well-designed, even more intuitive and easier to customize visual project management solution. In 2013 we have successfully released a bunch of new features and improvements. 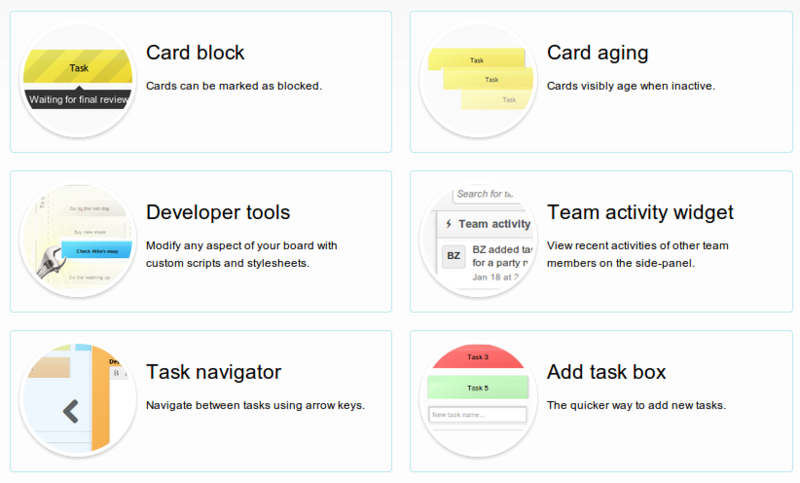 Below, we present the Big Six of the most important changes we made in Kanban Tool during 2013. 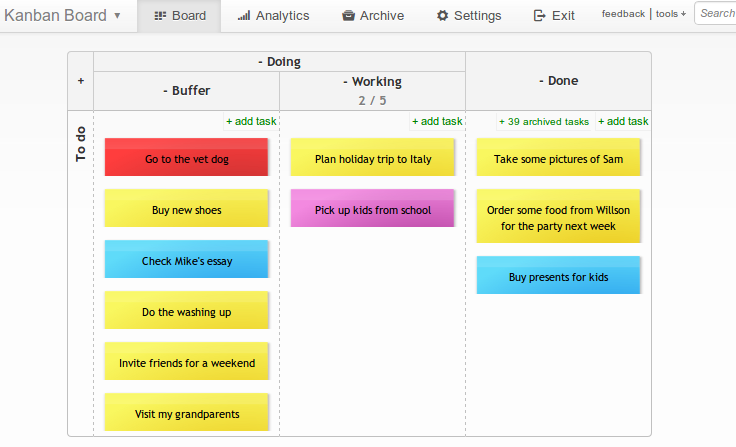 At the beginning of 2013 we have updated the look of Kanban boards. We made it much lighter, modern and user-friendly. Additionally, we have refreshed the navigation and implemented some small improvements to make it even more simple and intuitive. Kanban Tool On-Site is the perfect solution for especially large companies that comply with the highest data security standard and cannot use cloud-based solutions. On-premise Kanban boards can be easily customized to fit businesses of all types and sizes. Moreover, they can be easily integrated with your own IT infrastructure and existing systems. Interested in Kanban Tool On-Site offer? Contact us. Zapier enables you to connect Kanban Tool with other web apps you use to easily move your data and automate tedious tasks. You haven't tried it yet? Just visit the Kanban Tool integrations page on Zapier. Select an application you want to sync Kanban Tool with and create your first Zap. 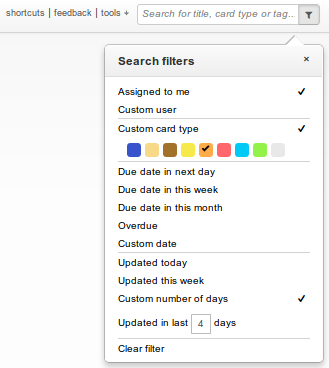 Powerful search filters will allow you to gain greater visibility over your workflow. For more advanced filtering you can use multiple filters together. The number of available power-ups is growing fast, as well as the collection of cool Developer Tools scripts. The following scripts are already available at our repository on http://github.com/kanbantool/scripts: High contrast, Large font, Card tilt, Delete all, Sorting animations, Fixed cards height, Save and done, Task done, Change column, Working time and Swimlane height. Thank you for using Kanban Tool throughout 2013. We hope that all these improvements will positively affect your productivity, make your work easier and far more pleasant in 2014. Should you have any questions or suggestions about them, please let us know by sending feedback. Your opinions are valuable for us and help us make Kanban Tool better every year. Remember to subscribe to our blog, not to miss the next big announcements this year!